This is a copy of the email sent out to our mailing list today, May 28th. Just a quick email to say hello. 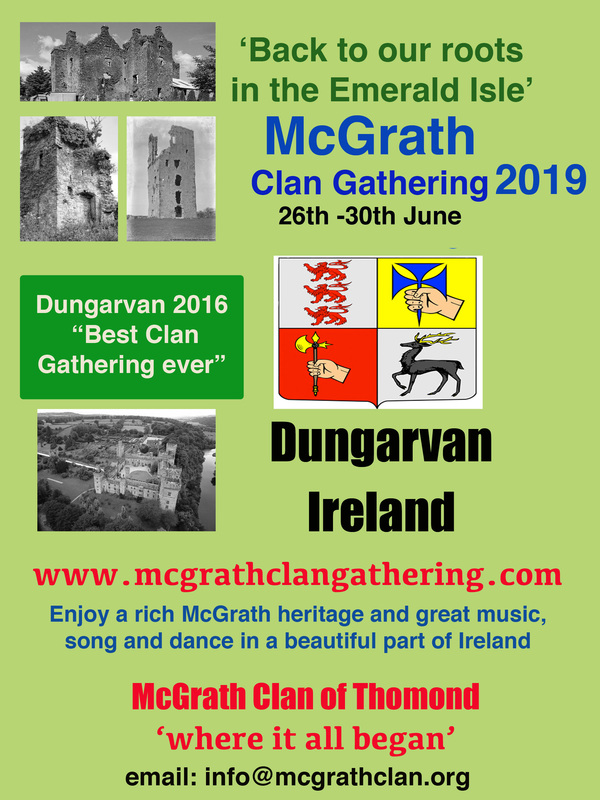 Everyone is getting a bit excited and rightly so, just less than four weeks to the 2016 McGrath Clan Gathering in Dungarvan !!! We have a detailed program of events for the four days. Only one or two times to be confirmed but everything is in place for a great gathering of our clan. At this minute, we will have people at the event from 9 countries. Check out http://www.mcgrathclangathering.com or our Facebook page for updates. We are hoping that everyone will have their registration completed in the next two weeks. Anyone who hasn’t registered yet, can pay for the gathering on http://www.mcgrathclangathering.com and email your details to danmcgrathmedia@gmail.com . Just include your name, postal address and what email you’d prefer us to use. The Park Hotel is now full for most of the weekend of our Clan Gathering. Anyone who is experiencing problems with hotels or B&B bookings, we will be able help to sort out accommodation locally with the help of the local Tourist Office. We are also checking the owners of the various premises, to see what’s available. A number of people have informed us of houses in the town which can also be rented for the Clan Gathering. Just email us as early as possible. Check our Facebook page for updates on what’s available. The Gold Coast Golf Hotel still has rooms and is owned by John McGrath. It’s located about 10 minutes drive from the town centre. We have added a number of B&B’s with rooms to our Facebook page. They will be on website shortly. There’s a new Coach service from Dublin city centre to Dungarvan. It runs every two hours and the bus is quiet comfortable. The company is called Dublin Coach. They also have a bus from Dublin airport to another location in Dublin, Red Cow LUAS, which connects with the Dungarvan bus. We have no control over the weather but hope it will be nice. However, you are advised to bring suitable coat, which you can wear in the event of rain. The sign in time is between 2.30pm and 4.30pm on Thursday 23rd. There is no problem if you are late or early. Just let us know an approximate time of arrival by email. We will be officially launching our DNA Project at the gathering. An email will be sent separately in respect of this project. The team behind it, are working hard to get everything in place and have as many answers as possible for the gathering. A limited number of each arrived today. We have an image of the flees top on Facebook and will put up the polo shirt later. Think that’s all for now, hope all is going according to plan with your preparations. Drop me an email if you have any questions. This entry was posted in Uncategorized on May 28, 2016 by McGrath Clan (official).